If you’re choosing a test maker tool and are overwhelmed by their numerous features, this article has got you covered. We’ve picked 7 popular tools for creating assessments and made a detailed comparison that will help you figure out which one fits best for your everyday tasks and workflow. Tech-savvy course developers who need to create tests with complex interactions, variables, etc. Question types. How many types of question a tool offers and how complex they are. Testing rules. How rich are the test customization options such as scoring system. Bells and whistles. Cool, yet not super-essential options fall into this category. Sharing and reports. How to publish a test and track learners’ results. 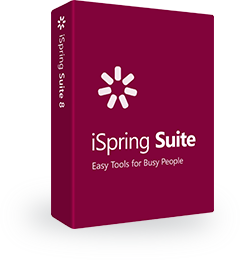 iSpring QuizMaker is an easy yet powerful tool for creating tests of any complexity — comprehensive employee assessments, online exams, interactive quizzes, quick surveys, and more. It will help teachers and e-Learning developers organize mobile assessment in record time and easily track each learner’s performance. The tool is easy to navigate, as it has tabs and ribbons similar to MS Office. With the WYSIWYG editor, tests are very simple to create. You can choose questions from 23 templates and simply fill them in with your text and media. Test design is responsive, so this tool will help you deliver a great mobile learning experience. Question types. iSpring QuizMaker has 23 graded and survey question types for comprehensive knowledge assessment, including Multiple Choice, Matching, Word Bank, Hotspot, Essay, Likert Scale, and so on. Testing rules. You can set time limits, the number of attempts, random question choice, and the opportunity to skip a question. Scoring is also very flexible: you can specify a passing score and assign points or penalties for each question, including partially answered ones. Questions are easily organized into groups, and each group can be graded separately so you’ll be able to assess multiple topics in a single test. Bells and whistles. Students can receive detailed feedback with audio and images. There is also a branching option to create learning paths for each student: learners can be directed to a specific question or explanation slide depending on their answers. It’s possible to enhance quizzes with images, audio, videos, and formulas. Plus, the test design is fully customizable: it’s easy to change backgrounds, layouts, fonts, and colors. Another benefit of iSpring QuizMaker is the free mobile app that allows students to take tests anywhere, even offline. Sharing and reports. Tests are created in HTML5 and Flash format, and can be published on a website, LMS, MS Word, CD, or a cloud sharing service offered by the same vendor. The preview option helps you see how a test will look on various devices before publishing. The tool offers insightful reports, so it’s easy to track each learner’s performance. You can get detailed results for each question or group of questions. Even if you don’t have an LMS, you are still able to get full reports via email or your local server. Articulate Quizmaker allows you to create complex non-standard assessments and is a good fit for technically advanced e-Learning developers. It has a lot of things to fine tune and allows you to make quizzes for all devices. This test maker is shipped as a part of Articulate 360, a bundle of 9 tools. Articulate Quizmaker is a standalone application with a PowerPoint-like interface. The tool features a lot of options and allows you to use both question templates and pre-made questions from scratch; however, it might take you a while to learn the ropes and explore all the capabilities. Question types. Articulate’s application has 20 form-based and 6 free-form questions, including both standard multiple choice, matching, etc. and complex drag-n-drop activities. Testing rules. There are a lot of settings to fine-tune. You can configure complex scoring (including negative points and points for partial answers), set the number of attempts, allow users to skip questions, and so on. Questions can be sorted into groups and shuffled. Bells and whistles. Test design and media are fully customizable: you can use templates, add audio, video, images and web objects, etc. Plus, this test maker is integrated with the Content Library, so you can enhance tests with characters and use beautiful slide templates. There’s an option to provide students with feedback for each question, and enhance it with audio and video. Branching scenarios are also easily created within a test. The vendor offers a free mobile app to take tests online and offline. Sharing and reports. Articulate-made quizzes can be published to the Web, an existing presentation, LMS, CD, or MS Word. Quizzes are published in HTML5 and Flash formats, so they’re easy to view on mobile devices. Plus, you can publish a test to Articulate 360 and share it online with colleagues for review. As for reporting, quiz results can be tracked in an LMS only. Articulate’s Quizmaker comes as a part of Articulate 360, a subscription to which costs $999 per year for one user. A fully functional 30-day free trial of the software is also available. Articulate Quizmaker is a full-fledged tool with many sophisticated features. With its freeform question types and rich design capabilities, it’s a good fit for tech-savvy e-Learning pros. However, it comes as part of a large, expensive bundle, which implies that the target audience is looking for more than just a quizzing tool. Respondus is designed to make assessments for learning management systems. It’s a good choice for university teachers, as it works with popular edu-focused LMSs, and the vendor also ships a special browser to prevent students from cheating. The tool supports Blackboard Learn 9.x, Brightspace 10.x, Canvas, Moodle, IMS QTI 1.x, and Pearson LearningStudio. Exams in Respondus can be made up from the available publisher test bank, or by using the exam wizard. First of all, you choose the LMS you’re using (the tool creates different “personalities” for each LMS), then create your questions and upload the test to your learning system. Questions may also be imported from Word or from other exams made with the software. The UI is a bit Windows 98-like, but all the essential features are easy to find. Question types. The number of questions varies for different LMSs. In general, the tool offers 15 question types, including calculated and algorithmic questions. Testing rules. With Respondus, you can protect your quizzes with a password, set time limits, block the right mouse button, or make students take the quiz through a special browser to prevent cheating. It’s also possible to allow students several attempts to take a test, and submit the answers after the deadline with no points awarded. Plus, you can create groups of questions and randomize them. Bells and whistles. You can access thousands of publisher test banks and create a test from ready-made questions. It’s possible to add images, videos, audio, formulas (there is a Mathtype-based equation editor), and Word and PDF docs to questions and answers. The feedback option allows students to check the right answers after taking a test. The vendor also ships Respondus Lockdown browser, which integrates with an LMS and helps prevent students from cheating. When taking an exam with this browser, students are unable to switch between applications, copy or print any text, etc. Sharing and reports. Sharing options are limited: Respondus-made tests can be printed or uploaded to an LMS. You can publish tests directly to an online course, or even multiple courses, and move them between different LMSs. There’s an option to preview how a test looks before putting it in an LMS. Reports are available in your learning system and include scores, overall stats and answer distribution. You can archive and restore quiz projects to share them with colleagues. The tool has a free 30-day trial. Licenses are available for $79 USD if you purchase with a credit card online, or $149 if you purchase via check or purchase order. Respondus seems to be the go-to software for university professors who use one of the LMSs it supports. Since the main function of the software is to administer and collect secure, timed exams, it would have little appeal for the business and training sectors. QuestionWriter HTML5 is another paid tool for educators which allows you to create customizable SCORM-compliant quizzes and track students’ results. It helps teachers and exam authors develop assessments for the Web and LMSs, fine-tune quiz settings, and get reports. QuestionWriter is a desktop quizzing tool with rich customization options. You can create tests from scratch or use one of 20 pre-made quiz templates (which, however, look a bit outdated). The tool supports HTML5 mobile-ready format, but the quiz design is not responsive, so the tests aren’t so easy to take on mobile devices. Question types. Question Writer offers 10 types of questions, including Multiple Choice, Matching, Essay, Explanation, and more. Testing rules. There are plenty of options to set (however, some settings are difficult to configure). You can set a time limit, so that the results are automatically sent to the instructor when the limit ends. It’s possible to assign points and penalties, grade partial answers, create question pools and randomize questions, and apply multiple scores. There’s also an option to ask for students’ details when they’re taking a quiz. Bells and whistles. There are 20 quiz templates, but their design and layout seem old fashioned. Teachers will appreciate the rich feedback options (answer, question, or quiz-level feedback, etc.) and branching feature, which helps customize the test scenario. Questions can be enhanced with images and Flash objects; audio and video are not supported. Sharing and reports. A test made in QuestionWriter can be uploaded to the Web or an LMS (if it supports SCORM 1.2), exported to text or QTI format, or printed. As for reports, teachers can receive them via email, export as Excel files, or check online. Quiz results can be sent to server or email (both teacher’s and students’). For $495 you can use everything the software has to offer, including unlimited test authoring and email/forum support, and access the test management software. QuestionWriter HTML5 allows users to create simple tests for the Web and a number of LMSs using basic question types. It works well for teachers who want to track students’ results and don’t need their tests to look professional and polished. Hot Potatoes is a free software bundle, available on both Windows and Mac, which includes six applications. Five of them are for creating different types of exercises, and the last one allows you to mix them. This test maker is a good fit for language teachers who want to make vocabulary quizzes and small practice exercises for their students. Question types. There are 8 question types including fill-in-the-blank, matching, multiple choice, jumbled sentence, and crossword. Testing rules. Everything here is pretty simple. Hot Potatoes allows you to assign allocated weights for some types of questions, set penalties for wrong answers, and restrict time to pass a test. Students may ask for hints or correct their mistakes during a test (and lose points for these actions). Bells and whistles. The tool lets teachers connect different tests so students can go from one activity to another. As for design and multimedia, it’s possible to add graphics, links, audio, and video to questions and answers. Plus, a special clipart library is available to illustrate basic vocabulary. Sharing and reports. You can publish tests as web pages (which are easily edited in WYSIWYG editors), create SCORM packages for LMSs, or copy quizzes to a document for printing. Test results can be sent via email through your server (requires complicated configuration) or reported in your LMS. You can also upload tests to the hotpotatoes.net server (it’s a virtual learning environment), and track students’ progress there. This platform is provided on a subscription basis (starts from about $64). Hot Potatoes is available as a freeware download from Half-Baked Software’s homepage. This test maker is free for non-profit or educational institutions, with the condition that the materials produced are freely available to anyone via the Web. Otherwise, a license starts with 1 user for $100 US. Hot Potatoes seems to be designed with K-12 educators in mind, particularly those in the Language Arts disciplines. It’s a good choice for creating easy drill-and-practice exercises to help students work toward mastery of a concept, rather than graded quizzes and tests. Google Forms allows you to create surveys and simple tests and save the results in a spreadsheet, while Flubaroo, an extension for Google Sheets, analyzes these results and grades them in a new spreadsheet. This combo is available from any device with an internet connection, and surveys and tests are easy to take from phones and tablets. Create a new Google Form, type in the questions, save the form, and add the answer keys. When you share the test with your learners and they take it, the results are collected in a special spreadsheet. To grade the results automatically, you need to install Flubaroo, a plugin for Google Forms. This tool quickly calculates students’ results and shows them on the same spreadsheet. Question types. There are 9 question types available, including multiple choice, file upload, checkbox grid, time question, and others. Testing rules. As Google Forms is better suited for surveys, the testing rules are quite simple. It’s possible to shuffle questions, collect students emails, and allow them to edit answers after submitting. Bells and whistles. You can collect students’ emails and leave individual feedback when they complete the survey. Form design is customizable: you can add a theme, change color, or include a photo header. Images, videos, links or websites can also be added to answer feedback. As for branching, a teacher can set up a test so that learners will only see certain sections based on their answers. Sharing and reports. Sharing is pretty clear: the tool is web-based, and you simply send a link to your learners. As for reports, a teacher can track the average score, the number of difficult questions, percent of students who gave the right answer, number of attempts, frequently missed questions, and so on. The report is displayed as a table or a diagram. Students can get their results by email. What’s also cool about Google Forms is the ability to share tests with colleagues for collaborative work and review. The tool is free. Google Forms + Flubaroo is a good pick for teachers who need to create a lot of surveys and quick quizzes, and don’t have enough time to do grading manually. Tests and surveys are available online and can be used for quick mobile assessment. QuizStar is a free online service for teachers which allows you to create quizzes for students, invite them to an online classroom, and view test results in your browser. Despite the fact that tests are made in a browser, it’s better to take them from PCs, since the website doesn’t have a mobile version. A teacher registers on the website, creates a test, and types in questions. Then they have to create an online class and assign the test to a group of students like in an LMS. Question types. The tool offers 3 simple types of questions: multiple choice, true/false, and short answer, which allow you to create simple assessments. Testing rules. You can create open or private online classes with self-registration. When set as private, tests can be assigned to students who log into the system with credentials given to them by their instructor. There’s an option to set the number of attempts, timer, and points. It’s also possible to specify test start and finish dates. Questions can’t be shuffled. Bells and whistles. Everything is quite minimalistic: there’s no customizable design, multimedia options, or branching. Students can get instructions and feedback for each question. The main pro of this service is that a teacher doesn’t have to purchase and install any software, but is still able to create online classrooms and get reports, like in a learning management system. Sharing and reports. Students take the assigned tests online right in their browsers. Reports contain test results overview, question analysis, and student results. The report manager allows you to send results to a teacher daily or weekly. QuizStar is an easy way to launch e-Learning in a school without an LMS. It is a good fit for teachers who want to assess students systematically, save time on preparation, and analyze students’ results. iSpring QuizMaker and Articulate Quizmaker will be the best fit for course developers. If you need to create beautiful mobile-ready quizzes in a snap and collect detailed reports, iSpring is a good choice. Articulate allows you to create complicated tests with layers and variables but takes more time to learn. Respondus can be the right tool for university teachers who use one of the LMSs it supports and want to prevent cheating on their exams. QuestionWriter is more feature-rich and is also a good fit for teachers; however, both tools have a rather old-fashioned UI and test design. If you need to create a lot of surveys or simple online quizzes and don’t want to install any tools or applications, check out the Google Forms and Flubaroo bundle. QuizStar will help school teachers who need to track students’ results but don’t have an LMS, and HotPotatoes is a good choice for those who create simple drill-and-practice exercises, especially in Language Arts.